To get into the mystery of life, sometimes you have to wander around as if you are lost. Deep understanding isn’t gained from reading or classroom activity. Rather, it is revealed when the heart is desperate. Imagine a little child chasing a butterfly at the edge of the woods. After two minutes of skipping into the forest (the butterfly now out of sight) all of the woods start to look the same. Turning around and going back would make sense, but the journey to that point wasn’t a straight line following the butterfly’s path. After some time, it becomes obvious that what we think to be true just isn’t true, and that’s when a journey of deeper wisdom can now begin. Desperation is incentive to really understand, to take notice, to pay attention to those around us, and to be in the moment. While there is a nice popular hiking trail to guide you to the spot where I viewed this waterfall, Grotto Falls wasn’t always so easy to find. 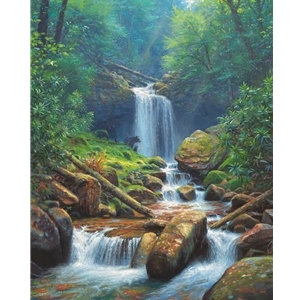 Next time you are up in the Smoky Mountains on one of those trails to see wonders like this, don’t let the foot paths and stepping stones lull you into complacency where you miss the chance to really be there and explore the mysteries of life. Make it an opportunity to really find the magic.